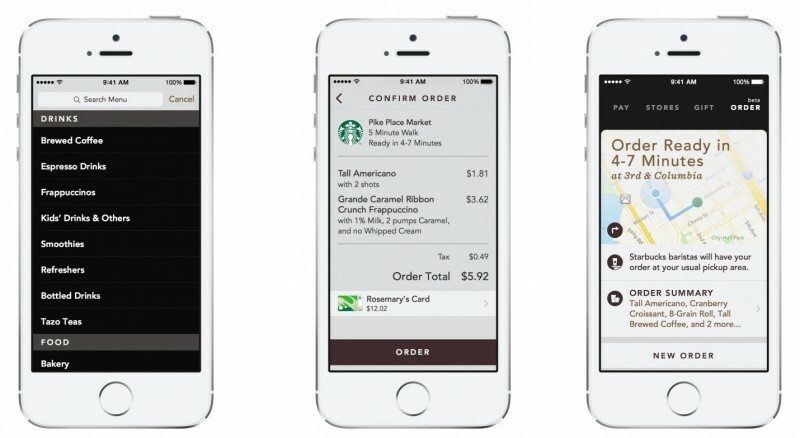 Starbucks Launches Mobile Order & Pay for iPhone in Portland, National Rollout Coming in 2015. Starbucks today launched its “Mobile Order & Pay” feature in Portland, Oregon, which allows customers to place an order on their iPhones with the Starbucks app and schedule it for a pick up, reports WIRED. The feature requires that users accept a one-time Location Services prompt in order to identify the nearest location accepting Mobile Order & Pay, and uses a customer’s connected Starbucks card to pay for purchases. 2. Select the food and beverage items to order: Just as in-stores, beverages are customizable, including the option to modify size, number of espresso shots, dairy selections and more. 3. Select the participating store for pick up: Approximate wait times will be viewable on the customer’s phone prior to selecting store location. Directions will also be available if needed. 4. Confirm by clicking “order:” At the time of order, payment is made from the customer’s registered Starbucks Card. 5. Proceed to the selected Starbucks® store to pick up food and beverages: Orders are immediately sent to the selected store where Starbucks partners (baristas) will begin preparing the items. Starbucks plans to roll out the feature to more cities in the coming months and expects to complete a national rollout next year. The move could end up being a significant one for the company, as CEO Howard Schultz recently announced that 7 million of its 47 million weekly transactions are made with phones. Starbucks also notes that Mobile Order & Pay will be rolled out to its Android app next year. 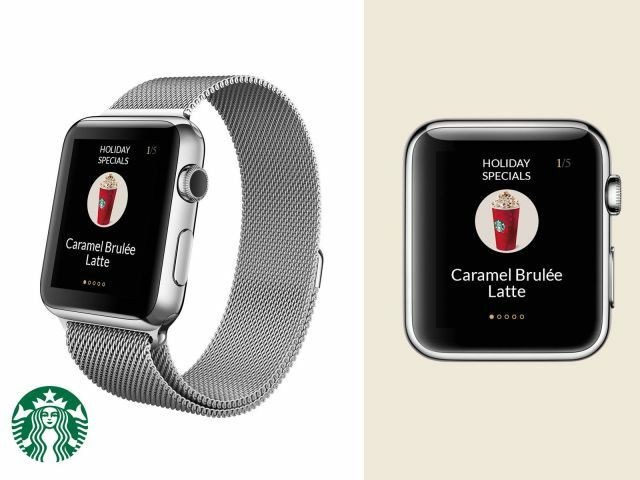 Concept app shows how Apple Watch would let you skip Starbucks line. We’re months away from being able to shackle our wrists to the Apple Watch, but the UI designers at Impekable have been busy dreaming up new app experiences that will delight wearers once the timepiece is finally available. Pek says his team’s has been curious about how to make intimate experiences on the Apple Watch, so to help other designers get off the ground with their ideas, they’ve also launched a free WatchKit design template that’s become one of the most popular Apple Watch resources on Dribbble. “Phones are very intimate, but watches and wearables can be even more intimate requiring less interaction because you don’t have to have it out – it’s on your wrist,” says Pek, whose team created the Starbucks Apple Watch app concept for CapitolOne’s recent WatchKit hackathon. However, there is one glaring flaw with the app concept: Starbucks doesn’t support Apple Pay. In fact, the Apple Watch SDK doesn’t even support fully featured apps yet like this concept. Pek says that’s not stopping his team from dreaming big. Completely native apps are expected to come later next year to Apple Watch, but developers are already imagining the possibilities. Starbucks has been pretty adamant that it won’t ditch its own loyalty card and mobile payments platform just to support Apple Pay on the Apple Watch, but after seeing how much easier it’d be to get java-addicts their morning joe, maybe Howard Schultz will realize it’s time to bend to the will of Cupertino. 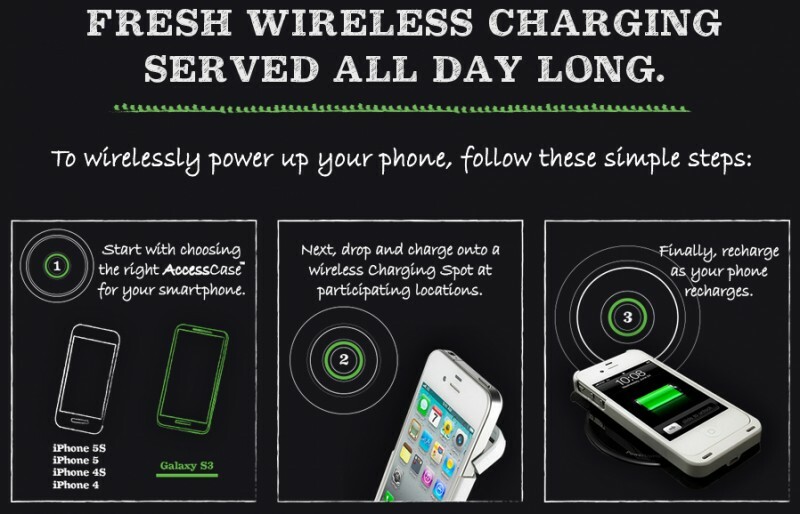 Starbucks to Roll Out 100,000 Wireless Smartphone Chargers at 7,500 U.S. Stores. Starbucks, in collaboration with Duracell, has announced that it will begin rolling out more than 100,000 Duracell Powermat wireless smartphone table chargers throughout 7,500 of its stores in the United States over the next three years. The announcement comes after the program was initially tested in Starbucks stores across Boston, Massachusetts and San Jose, California. 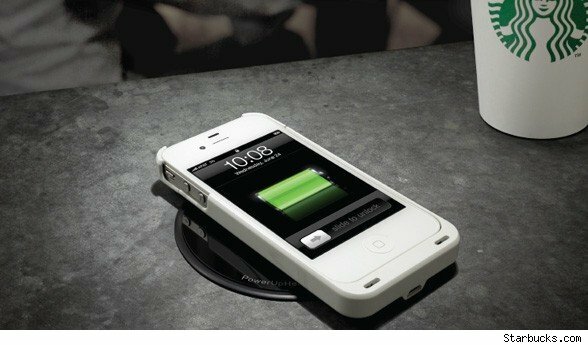 Notably, while Apple’s current iPhone line isn’t compatible with wireless charging out of the box, Duracell currently offers an AccessCase accessory for the iPhone 5s, iPhone 5, iPhone 4S, and iPhone 4 that is compatible with Duracell’s Powermat and Starbucks’ wireless table chargers. While phone manufacturers like Motorola and LG have added wireless charging capabilities to their phone over the past few years, Apple has yet to add the feature to the iPhone. However, Apple has shown past interest in the technology, with a report in 2011 noting that the company was experimenting with WiTricity wireless charging and another report in 2013 stating that Apple was looking at Qi inductive charging for the iPhone 5s. Apple is also said to be including wireless charging functionality in its highly-rumored iWatchsmartwatch, which is expected to launch this October. Starbucks releases iOS 7-friendly iPhone app with a few new tricks. We’ve already seen Starbucks show off a new way to pay and tip your barista in the long-awaited update to its iPhone app it previously announced, and today it is finally available and features a brand new design for iOS 7 when buying your latte. Previously, the Starbucks app featured a number of various tabs on the bottom navigation bar, but the updated version has been dramatically simplified to focus on three main sections under the headers Pay, Stores, and Gift. Reward member profiles, messages, and Pick of the Week content is now featured in a clean view with the app’s new tip feature as well. The update also comes with a new icon to represent the refreshed design of the app. However, the update does remove customized drink saving within the app. Starbucks advises you screenshot the view of your customized drink to save it if you use this feature. Starbucks for iPhone is available for free on the App Store (although your milage may vary for the next few minutes following yesterday/this morning’s iTunes Connect issues). Starbucks Pick of the Week codes can now be redeemed with App Store camera feature. Along with iOS 7 came an update to the App Store and how you redeem gift cards. Until now, it’s been restricted to iTunes Gift Cards only. Other redeemable cards required the age-old typing in of digits. This applied to Starbucks’ Pick of the Week cards. For those that don’t know, these are the cards you’ll often see sitting on show at your local coffee chain. Each week the company offers a free app, book, album etc. On the back, is the usual redemption code. Now, users looking to redeem these cards can do so using the iOS 7 camera feature. Redeeming a code using your camera is simple. Open up the App Store app and scroll to the bottom of the home “featured” page. You’ll see a “redeem” option. Tap on it, and the next screen then asks if you want to use the camera. Once you’ve selected the camera as input method the camera UI will load up on screen and any code inside a rectangle frame will be automatically recognized and used to download the free content. Clear for iOS free today courtesy of Starbucks. 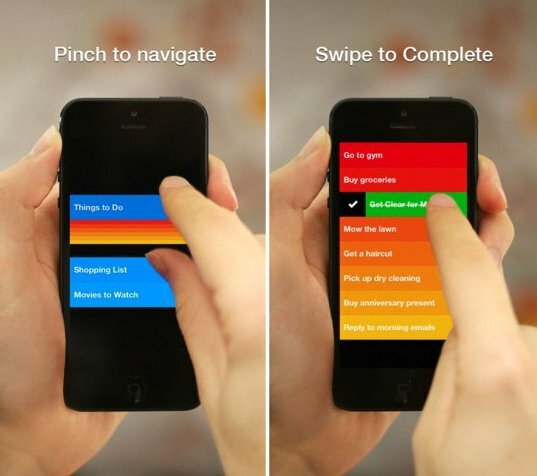 Fantastic iOS to-do app Clear is free today, courtesy of Starbucks. Clear usually retails at $1.99 on the App Store, and allows you to create prioritized to-do lists using a series of gestures and swipes for the optimum user experience, lists also sync with iCloud. The link below will open iTunes and automatically enter a Starbucks code, allowing you to download the app for free if you so wish! If you haven’t used Clear before, then I’d seriously recommend it, it’s a really simple app, but very useful!